Hello and welcome to another article on Kalanirmitee. 1. Take a blank card. 2. Make a basic closed coils of any colour you wish. Shape the basic coil into desired shape. And assemble them into a quilled flower. Add some quilled scrolls and leaves. 3. To make fringe flowers, take 1cm/10mm quilling strip. Fold the quilling strip into half lengthwise. Cut slits into the paper strip. Roll the fringed strip into a tight circle. Fluff the fringes outwards.The fringe flower is ready. 4. Add sentiments/ quotes. It can be handwritten, printed or stamped. Please feel free to contribute and suggest any of your ideas. Your suggestion and comments will always be welcome. Hope you enjoy my blog. 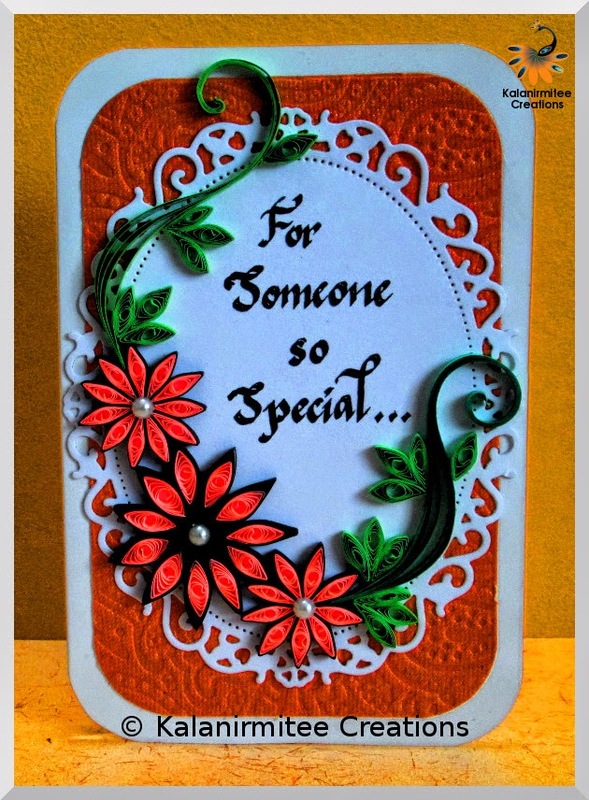 Paper Quilling is an art form that involves the use of strips of paper that are rolled, shaped, and glued together to create decorative designs. The paper is rolled, looped, curled, twisted and otherwise manipulated to create shapes which make up designs to decorate greetings cards, pictures, boxes, eggs, and to make models, jewelry, mobiles etc. 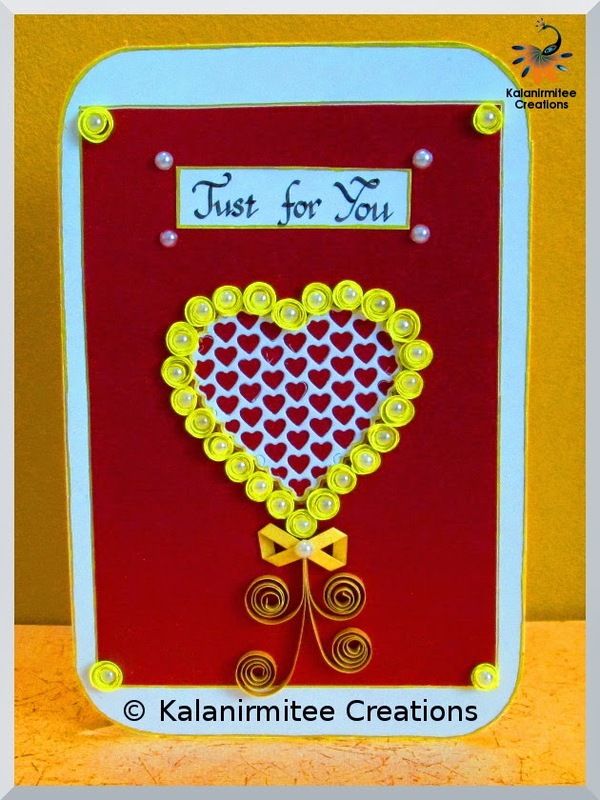 Quilling starts with rolling a strip of paper into a coil and then pinching the coil into shapes that can be glued together. There are advanced techniques and different sized paper that are used to create 3D miniatures, abstract art, and quilled flowers among many things. Your comments will be published shortly. 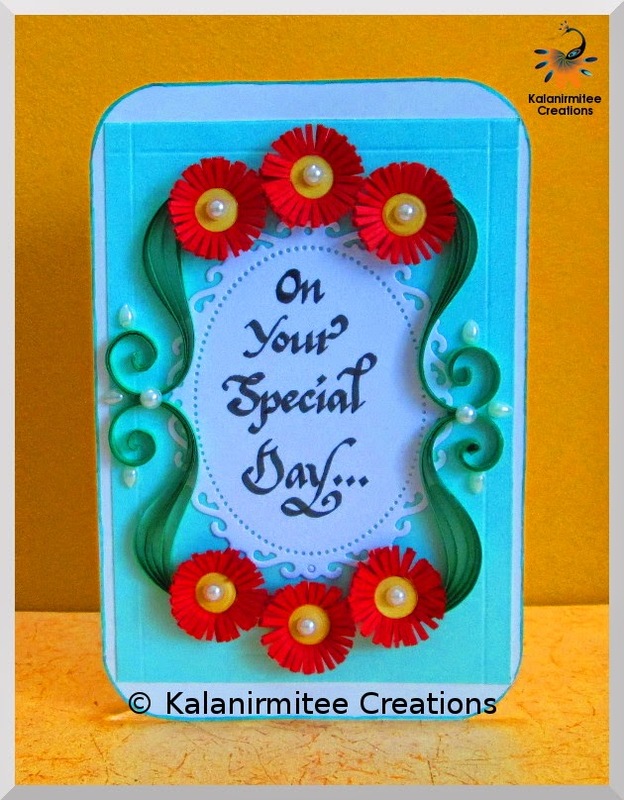 Follow Kalanirmitee's board My Quilling on Pinterest. PAPER-ROLLING, PAPER-SCROLLING, FILIGREE, MOSAIC and QUILLING are all names which have been given to our art during its long history. Some sources suggest that many of the techniques we use today were originally practised in Ancient Egypt. Lamasa is a clay like substance, made by mixing and heating commonly available ingredients, such as corn flour. It is used to create flowers, figures and objects such as paper clips, pencil caps, napkin holders, decorative, jewelry and tumblers. A mural is any piece of artwork painted or applied directly on a wall, ceiling or other large permanent surface. A distinguishing characteristic of mural painting is that the architectural elements of the given space are harmoniously incorporated into the picture.